Last May, I started writing a review of the two books that have helped me the most in growing a vegetable garden in the Pacific Northwest. But I put off publishing it, because it did seem rather, you know — specific. But I'm back into gardening this year, and they still stand as the most influential in my planning, so — they deserve a shout-out. If you're also in Seattle or similar and are planning out your vegetable garden for this year, grab these books and get going. Spring is on the way — hurrah! This book by Steve Solomon is written with confidence and thoroughness. You can tell Solomon is a master gardener who knows his stuff — and who knows this climate, and what works here. He advocates organic methods, which I really appreciated, but isn't afraid to suggest optional chemical methods when appropriate and safe. He explains gardening down to the composition of the dirt and explains why just piling on compost isn't necessarily going to be helpful. In general, he tells you why gardening methods that work well out East don't automatically translate to the Northwest Coast. For instance, he explained why my melon dream didn't pan out: just not enough sun strength, alas. 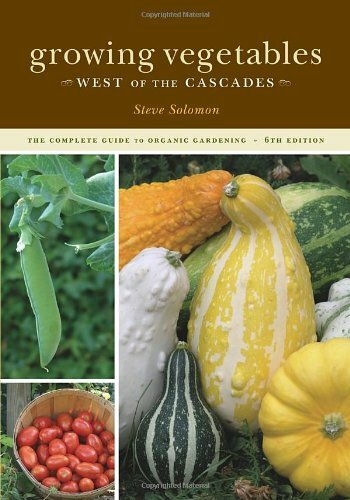 What was most interesting to me about reading this and the other Northwest gardening books was realizing that you can garden year-round in the Pacific Northwest climate. Solomon gives details of what crops grow well, which ones will help your pantry and the soil through overwintering, and what sort of crop rotation will keep the soil at its healthiest. Solomon generally doesn't recommend raised beds because of his theories on crop rotation, but keep in mind that he's dealing with quite a large garden — really more of a small farm. In my last garden, I had about four square feet to work with, so crowding all my crops together was really my only option! That said, if you have the space to play with, Solomon's ideas seem sound and tested. I took extensive notes on which plants to start when, and when to harden the seedlings and transfer them outside. I also resolved to look for the particular seed varieties Solomon recommends. This is a very detailed book that you will reference again and again! 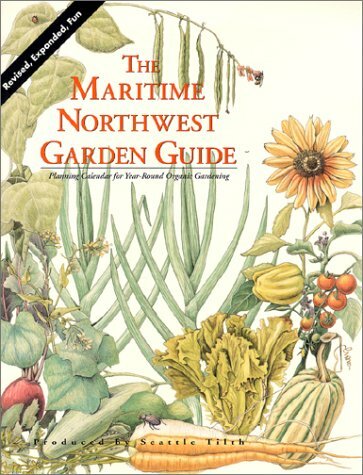 The Maritime Northwest Garden Guide is produced by the Seattle Tilth, an organic gardening advocacy and educational organization, and written by Carl Elliott and Rob Peterson. This book is tailored to the area and how to garden organically and effectively in the Northwest coastal climate. It talks climate zones, bugs and diseases, and various set-ups to help warm your soil and shield your plants to lengthen your growing season. One of the most useful features is the month-by-month planner suggesting what to do for each period. There are also suggestions for gardening with kids. I hope to do most all my gardening this year with a certain little tyke in tow, so I love that aspect! It looks like it's cheaper right now to buy the most current copy of the book through the Seattle Tilth ($14.95 + tax and shipping). 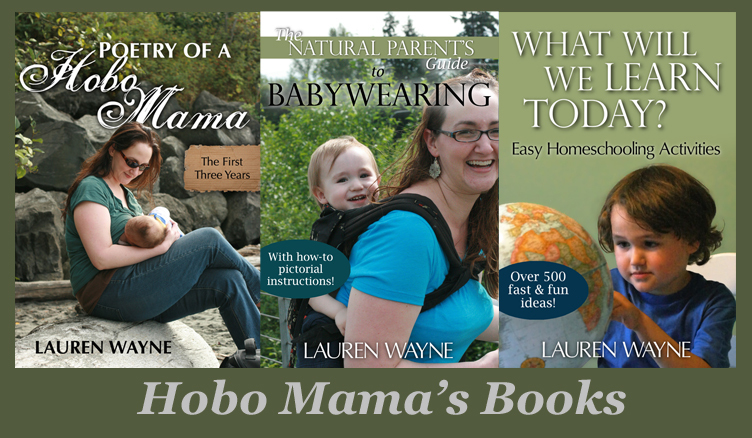 You can view the Amazon page for reviews and more information. By the way, the Seattle Tilth is sponsoring an Early Spring Edible Plant Sale on March 20, so check it out if you're in the area! And say "hi" to me — I'm sure I'll be shopping for hours. Choose from an amazing selection of edible plant varieties proven to perform well in the Pacific NW during the cool season, starring rare and heirloom organic vegetables. We will also be selling perennial edibles such as favorite cane fruits, unusual fruiting shrubs and trees from One Green World in Oregon, culinary herbs and edible flowers. Celebrate the first day of spring by getting the healthiest plants for your garden this year and starting with the best selection of edible veggies, fruits and herbs in the region! just put these two titles on hold w/ library.